This majestic structure believed to be up to 800,000 years old,(yup, it isn’t a typo) is one of the most mysterious monuments on Earth. It has no inscriptions, and there are said to be tunnels and passages leading below it. The images here displayed were taken prior to most of the restorations of the Sphinx. The images are extremely rare and old. Scholars have no idea who erected this majestic monument only adds to the mystery of the Great Sphinx, which has already been the center for countless speculations connecting it to lost civilizations and extraterrestrial beings. At 241 feet long and 66 feet high, the Great Sphinx of Giza holds the record as the largest monolith statue on the surface of the planet. The Great Sphinx is believed to have been discovered in AD 1817, when the first modern archaeological dig, led by Giovanni Battista Caviglia managed to uncover the Sphinx’s chest for completely. This marvelous ancient piece of architecture remains one of the few ancient pieces of work that nobody bothered to take credit for, and mainstream scholars have been perplexed by its mysterious history for years. Many researchers consider the Sphinx to be an astronomically aligned monument. Geological findings indicate that the Sphinx may have been sculpted sometime before 10,000 BC, a period that coincides with the Age of Leo, or the Lion, which lasted from 10,970 to 8810 BC. According to Graham Hancock, computer simulations show that in 10,500 BC the constellation of Leo housed the sun on the spring equinox – i.e. an hour before dawn in that epoch Leo would have reclined due east along the horizon in the place where the sun would soon rise. This means that the lion-bodied Sphinx, with its due-east orientation, would have gazed directly on that morning at the one constellation in the sky that might reasonably be regarded as its own celestial counterpart. Today there are countless images of the Great Sphinx of Giza, and nearly all of them show it as it is today, nearly completely restored to its full glory. 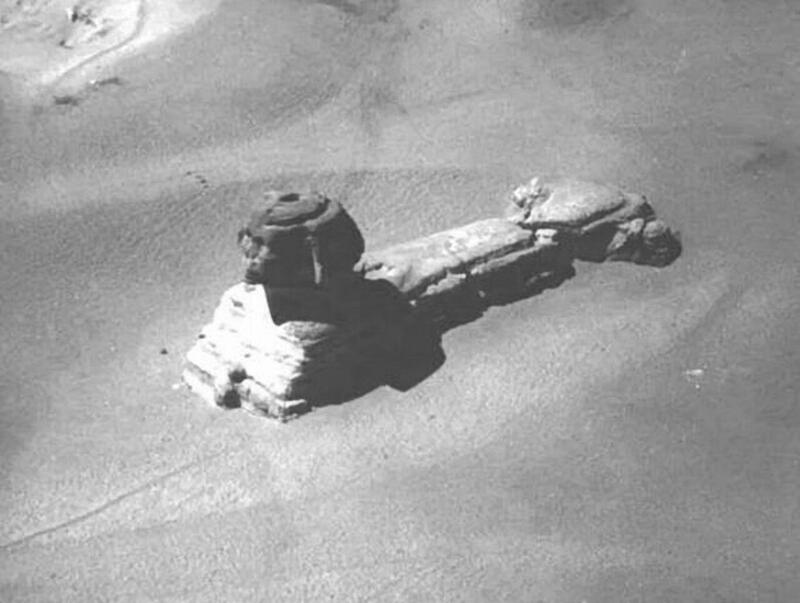 However, the most interesting images taken of the Sphinx are those taken after its discovery. While many people are unaware, there are numerous extremely old images of the Sphinx, which show this incredible ancient monument as it looked prior to its restorations in modern times. The images depict numerous cavities, entrances and what appear to be tunnels that according to many leads below this majestic ancient monument. British soldiers posing at the Great Sphinx at Giza. Image Credit Unknown. The Sphinx prior to being excavated.